Hoke Correctional Institution is located on Old Highway 211 west of Raeford. The prison currently has three major administrative and housing buildings. The South Unit is a housing area for transient inmates along with some regular population inmates. The North Unit is a dormitory housing the institution's workforce and Department of Transportation highway work squads. Central Unit houses regular population inmates and has 24 cells for placing inmates in administrative or disciplinary segregation, and 24 cells for protective custody. Established in 1954, the facility was part of the McCain Sanitarium built at the site in the 1920's. In the 1970's, the prison was converted to a minimum security unit. It was later returned as a medium security prison. During the 1970's, inmates under the supervision of correction engineers erected a recreation building. In 1980, a housing unit with 144 single cells was added. The General Assembly provided for a 104-bed dormitory as part of the $28.5 million Emergency Prison Facilities Development program authorized in 1987. This addition was completed in 1989. 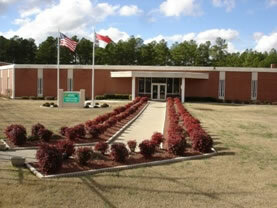 Hoke Correctional Institution is a visitation-by-appointment facility. Visitors may schedule appointments by calling 910-944-7612, ext. 431 or 344, Tuesday through Friday from 9 a.m. to 4 p.m. Appointments must be made at least two days in advance and not more that two weeks in advance. Special visits for law enforcement agents, social services personnel and lawyers are made by submitting a formal written request via mail or fax. Inmates assigned to segregation will be allowed one visit in a 30-day period, unless visitation privileges have been taken through disciplinary action. Visitation hours are subject to changes at the facility's discretion. Tuesday 12 – 1:30 p.m. 2 – 3:30 p.m. 8:30 – 9:30 a.m.
Wednesday 2 – 3:30 p.m. 12 - 1:30 p.m.
Thursday 2 – 3:30 p.m. 8:30 – 9:30 a.m.
Friday 8:30 – 10 a.m. 10:30 – 11:30 a.m.
Saturday 8:30 – 10 a.m.
From Raleigh – Take U.S. 1 South to Southern Pines/Aberdeen. From Aberdeen, take U.S. 15-501 approximately 0.8 of a mile. Turn left onto Hwy. 211 East. Travel approximately 9 miles to McCain. The prison is on the left. From Fayetteville – Take U.S. 401 South to Raeford. From Raeford, take Hwy. 211 West. Travel approximately 10 miles. The prison is on the right. From Rockingham – Take U.S. 1 to Aberdeen. From Aberdeen, take U.S. 15-501 approximately 0.8 of a mile and turn left onto Hwy. 211 East. Travel approximately 9 miles and the prison is on the left.